Checking the weather day-to-day is pretty routine for all of us. The difference between 92 degrees and 60 degrees means deciding whether to wear shorts or pants. But we’re not the only ones sensitive to the change in temperature. A hot or cold day has a huge effect on how our roof surfaces function. In the United States, over 90% of the roofs on major buildings are dark in color, which can reach dangerous temperatures of over 150 degrees (hot enough to fry an egg). In the last 10 years or so, cool roofs have caught on with building owners due to its enhanced durability, reflectivity, and insulation. In the long run, a cool roof is extremely energy efficient with benefits that save a ton of energy dollars. With the passing of Title 24 Energy Efficiency Building Standards in California, and the rebates given by utilities companies, cool roofing has become the fastest growing area in the roofing industry. Meeting the requirements and standards for a cool roof can be tricky to navigate, but our experts at GreatWay Roofing know the ins and outs. So what is a cool roof? A cool roof absorbs less heat than the standard granulated cap sheet roof, which helps regulate temperatures inside the building, cuts down on maintenance costs, increases the lifespan of the roof, and reduces the overall energy needs and costs. Cool roofs also benefit the environment as it reduces carbon emissions and smog from the “urban heat island” effect we experience in cities. At GreatWay Roofing, we install cool roofs for commercial buildings using a premium fluid-applied cool roof system with Western Colloid products—a leader in the roofing and coating industry in the United States. 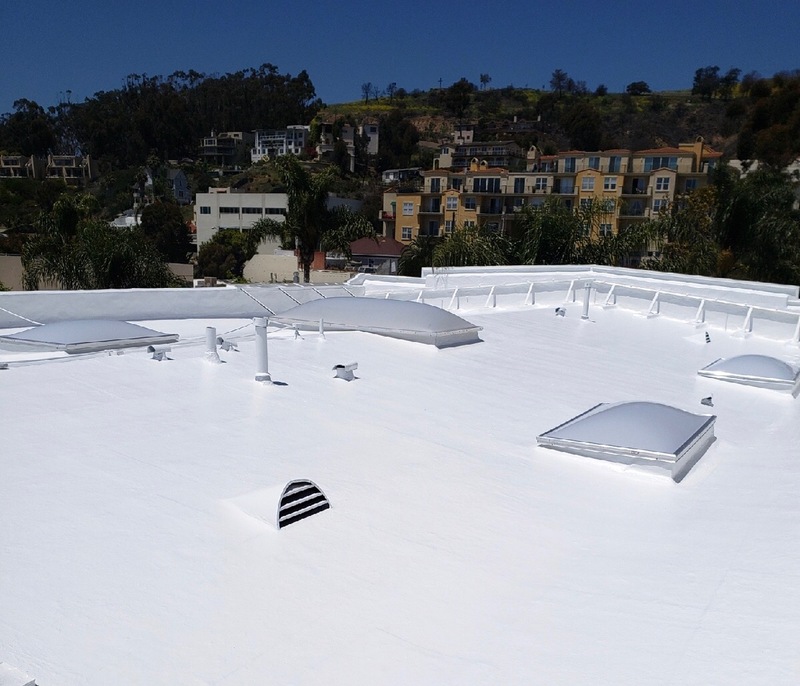 With this fluid-applied cool roof system, building owners can reduce their current energy costs as much as 30% and apply it over Built-up Roofing, modified bitumen, single-ply, spray foam, and metal. This system also extends or eliminates the need to re-roof as it can be applied directly and seamlessly over most existing flat roofs with ease. GreatWay Roofing has installed several cool roof systems in Ventura and Santa Barbara Counties, the Santa Clarita Valley and the San Fernando Valley. Our customers have seen huge results in how much cooler their buildings are and appreciate the long-term utility bill savings. If your commercial building is in need of a new roof, contact us today so we can help you come up with the best solution to meet your needs. Click here for additional details and benefits of installing a cool roof system and to learn how you can further reduce your energy cost.